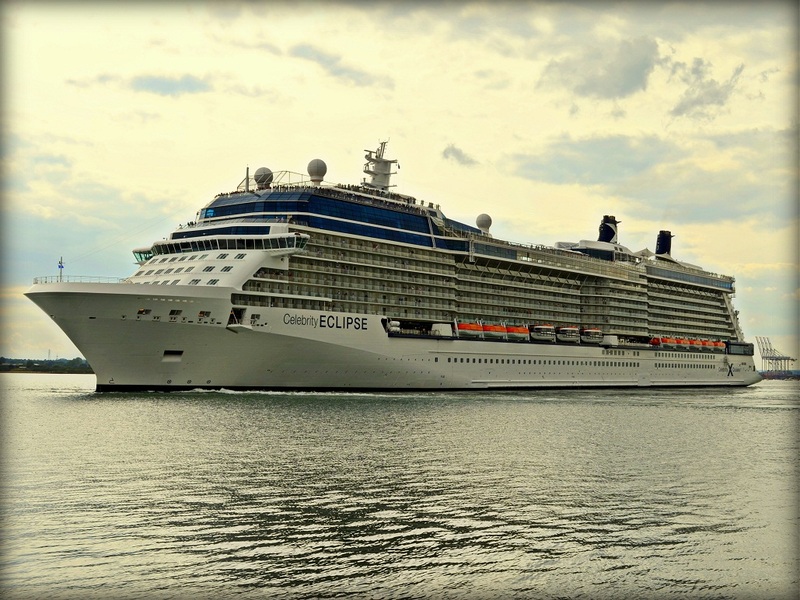 Celebrity Cruises tag line proclaims “When the journey matches the destination, that’s what we call Modern Luxury”. Stepping aboard the 122,000 tonne, 1033 ft long Celebrity Eclipse it is immediately clear that she oozes contemporary elegance from every corner and it seems to all be about relaxation and igniting the senses. I haven’t yet cruised on her, but have just spent an all too short day having a good nose around her and a 4 course lunch on board in her main restaurant. Being greeted at the gangway with a free glass of orange juice or champagne set the tone well for the day and gave an immediate good first impression. This is apparently offered at every port of call and I can imagine it going down very well after a long, hot day ashore on an excursion. It certainly went down well enough in a hot and sunny Southampton! The class of this ship is abundantly apparent wherever you look. The lighting, décor and mood flows seamlessly from one bar to another and from one passageway to another. 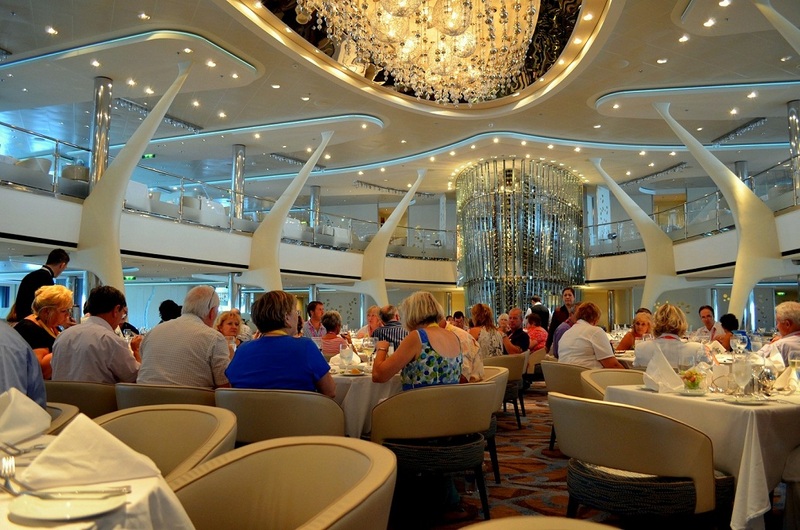 The layout is much the same as most other modern, large cruise ships with bars, cafes and facilities all spread out off a central atrium and several corridors. However, the layout didn’t feel cramped and it seemed that the 2,850 passengers would be able to negotiate all areas without too much trouble. The ship apparently has around 1,200 staff, giving a passenger to staff ratio of nearly 2:1 which is pretty high and should ensure a personal level of service. All the staff during the visit were smiley, courteous and very happy to help, even though we weren’t “real” fare paying customers. Despite maintaining the overall design theme throughout the ship, all the public spaces have their own contrasting identities with subtle mood changes between areas. Walking around the ship it was difficult not to be amused and maybe even a little bemused by the sheer number of weird and wonderful designs of chairs that are dotted around. Everything from lazy chaise lounge to high backed, supple leather chairs; big cosy sofas; futuristic looking loungers; sixties inspired seating and many, many more weird but wonderful designs where you could happily park your behind. When I go back next summer for my two week cruise, I am going to try to sit in every different type of chair onboard, but the cruise probably won’t be long enough! Whatever and wherever you want to eat or drink on Eclipse, you will find something to suit your craving and you will be spoilt for choice; whether it be a Martini in the Crush Bar, complete with a frosted bar top and a table decorated with crushed ice down the middle; or the Cafe Al Bacia for some specialty Formosa Oolong tea. The food choice is incredibly varied too. You can enjoy a simple burger at the Mast Grill, a buffet with almost every possible taste catered for at the Ocean view Cafe, freshly prepared crepes at the Bistro on Five, or for a reasonable additional fee you can opt for the specialty restaurants. Of the specialty restaurants the stand out one by far, and one of the main attractions on Eclipse, is Qsine. It’s difficult finding original words to describe this weirdly wonderful restaurant that haven’t been used before by others; so I will paraphrase and plagiarize and twist with my own interpretation: if you imagine the staff canteen at Willy Wonka’s Chocolate Factory, crossed with the Mad Hatter’s Tea Party and Hansel and Gretel’s house, with a menu that could have been influenced by Heston Blumenthal, you’d be getting the gist! The appearance of the place is one thing, the menu is quite another. I won’t spoil the experience for anyone planning on trying it for themselves, as it has to be seen to be believed, but I will tell you that the menu itself is an iPad which is fully interactive. The pudding menu, however, is akin to a Rubik’s Cube! As for the food itself, well, that ranges from cupcakes you decorate yourself, to a meze delivered in what looks like a display shelf unit! And with that, onto Eclipse’s other main attraction: The Lawn Club. 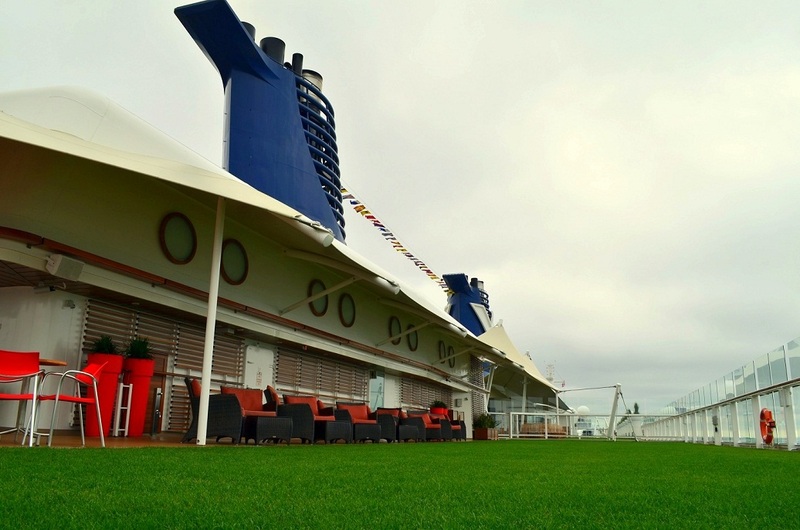 Yes, this ship has a field on its upper deck! A field doesn’t really do it justice to be fair, although a grazing cow or a few sheep dotted around it wouldn’t be amiss and frankly, given the other oddities on this bizarrely beautiful ship, I’m surprised no one has thought of adding farm animals yet! The lawn, as perhaps I should respectfully refer to it, is actually a strangely appealing addition to this ship. What could be more relaxing than a leisurely game of bowls or a picnic on a big rug sat on soft, freshly mown, lush green grass, all whilst sailing along at 20 knots with a gentle sea breeze wafting over you as you soak up the warm Mediterranean sun and gaze out at the distant horizon as the waves gently rock the ship?! 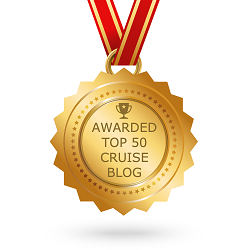 This isn’t just a cruise. 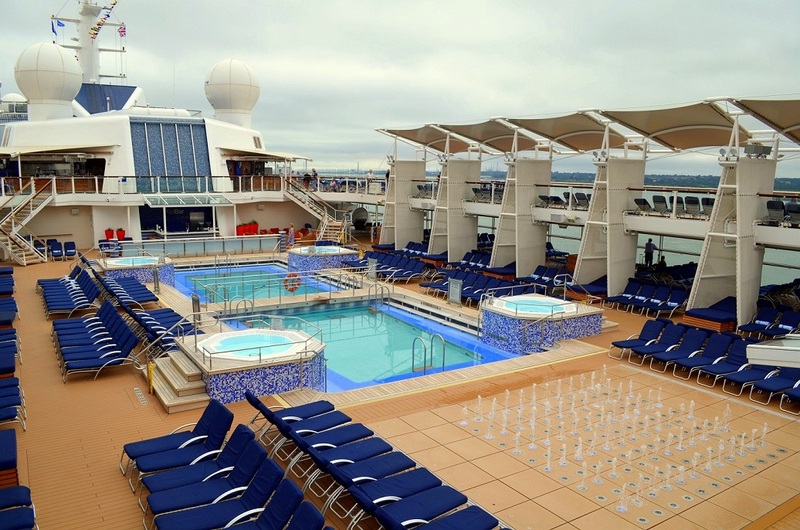 This is the “Celebrity Life”…as the cruise line’s catch phrase for its onboard activities says. Back down on the pool deck and extending the weird and wonderful seating options even further, the solarium contains a wonderful double hammock bed and lovely private cabanas where you can chill in the serene surroundings. 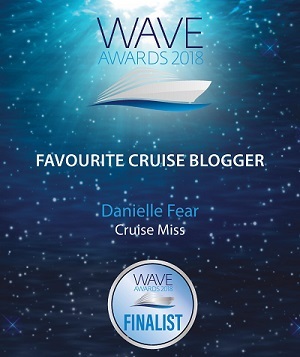 Talking of chilling, if the sea breeze is not quite so idyllic and is more of a force 9 gale, the towel station also offers blankets that you can snuggle up with on one of the many luxurious, thick cushioned sun loungers dotted around the upper decks. Entertainment on the ship is centred around the main theatre with the usual mixture of headliner and production shows, although one of the shows is apparently a slightly quirkier Cirque Du Soleil style show. There is also a smaller show lounge which is more of a comedy club venue. Back up on the lawn, the Corning Museum of Glass has a glass blowing show every sea day. 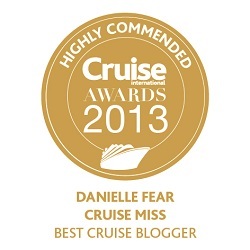 Sounds unusual, but I’ve been told it is captivating and well worth seeing at least a couple of times on your cruise. The newest ships of the class have a barbeque style cafe instead, so catch this while you can on Eclipse in case they change it when she goes in for a ‘refresh’ (although she is still absolutely pristine, so I doubt that will be needed any time soon). Another location well worth a mention and one which I can definitely see being a favourite for me personally when I travel on Eclipse next year, is the Sky Observation Lounge. It’s the big squarish structure above the bridge of the ship, encircled by dark blue floor to ceiling glass. It’s a large lounge with big panoramic views through those huge window panes. In the middle is a bar and in the corner is a small stage for some relaxing live music. The unobstructed ocean vista is coupled with yet more comfortable seating choices, including sofas arranged in a living room style complete with mock fireplaces! Completing the tour was a 4 course meal in the Moonlight Sonata restaurant – I say 4 courses, for me it was 5 as I kindly ate my wife’s starter for her! Although there was a limited choice on the menu for the tour, the quality and type of food was representative of a typical day. The food was well presented, fresh, tasty, cooked to perfection and went down very well with all at the table. The restaurant itself was nothing short of spectacular. Spanning two decks, it is less traditional than some ships but was in keeping with the rest of Eclipse. 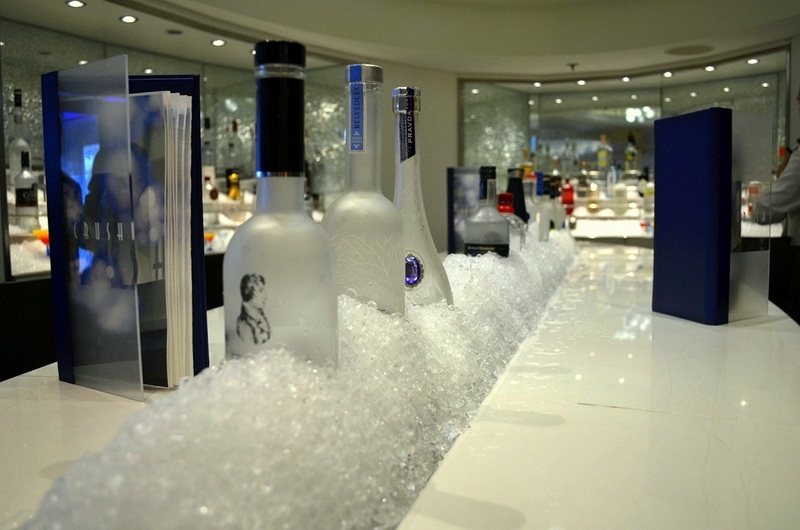 It was bright, airy and exuded an exquisite almost natural elegance with its bright white and blue décor, garnished with sparkling crystal style lights and highlighted by a floor to ceiling towering centrepiece that also serves as the biggest wine rack at sea. Booking a cruise on Eclipse before this brief visit seemed like a bit of a gamble, given my own preference for another big ship in the Royal Caribbean Cruise Lines family. I couldn’t help but worry whether it would be the right ship for me. This visit, however, has eased any fears that I may have had in that respect. Eclipse doesn’t have some of the fun features of other brands like climbing walls, surf simulators or an ice rink. Instead, what she does offer is an alternative; something classy but not stuffy, an elegant beauty, the temptation of total relaxation, along with weird, wonderful new experiences. 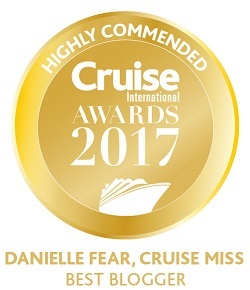 I am expecting a completely different cruise on her, one where I can completely zone out, switch off and chill in sublimely sensuous and tranquil surroundings. That will for me will be “Modern Luxury” and if the destinations just so happen to live up to the fabulous journey on Eclipse too, well, I will be truly spoilt! Love the Lawn feature makes this ship so distictive. Proving very popular especially the sailings from Southampton. Fantastic liner just been on a med cruise on the celebrity solsice,wonderfu lexperience very similar liner.Brilliant service ,spotlessly clean,nothing too much trouble for the staff Holiday of a lifetime.Highly recommend this company.